Full Sail University is proud to announce the new season of the hard-hitting reality series, WWE Tough Enough, will emanate from Full Sail University located in Winter Park, Fla. Premiering Tuesday, June 23, at 8/7C on USA Network, live segments direct from Full Sail University’s professional production studios will be featured during the broadcast each week. Outside of the U.S., WWE Tough Enough airs live on OSN Sports 2 HD across the Middle East and North Africa, Ten Sports in the Indian subcontinent, Cielo in Italy and on YouTube around the rest of the world. In 2012, WWE and Full Sail University began a multi-faceted partnership in the pursuit of educational, real-world production, research, innovation, and scholarship initiatives. One of the key components of the collaboration between WWE and Full Sail allows students of the university’s entertainment-focused degree programs to gain real-world experience alongside WWE’s professional production staff during tapings of WWE NXT, and will now expand to include the production of WWE Tough Enough. Additionally, the educational component of the relationship has included the development of a student scholarship fund, which to date has provided select Full Sail students with $140,000 towards their education. WWE Tough Enough is hosted by WWE Superstar Chris Jericho, who will be joined by a panel of judges including WWE Hall of Famer Hulk Hogan, WWE Superstar Daniel Bryan and WWE Diva Paige. This season will combine the can’t-miss excitement of live television with reality-show drama, as WWE hopefuls vie for the once-in-a-lifetime opportunity to become the next WWE Superstar or Diva. Unlike anything on television today, the lightning-fast hour of entertainment and competition will include live results every week, giving fans worldwide the power to decide who stays and who goes the very same night. Every week, the three judges will each nominate one competitor they believe should be cut, and it will be up to the WWE Universe to vote and determine who they feel is “Tough Enough,” to remain in the competition. The competitor with the least number of votes will be eliminated. Throughout the season, each judge will have the ability to save one competitor from being sent home. Ultimately, one man and one woman will be considered “Tough Enough,” with each earning a one-year, $250,000 WWE contract. Each week, the competitors will be coached by WWE Legends Booker T, Billy Gunn and Lita, and competitors will come face-to-face with WWE icons including WWE Chairman & Chief Executive Officer Vince McMahon; Executive Vice President, Talent, Live Events & Creative, Paul “Triple H” Levesque; and WWE Superstars John Cena, Big Show and Randy Orton, among others. 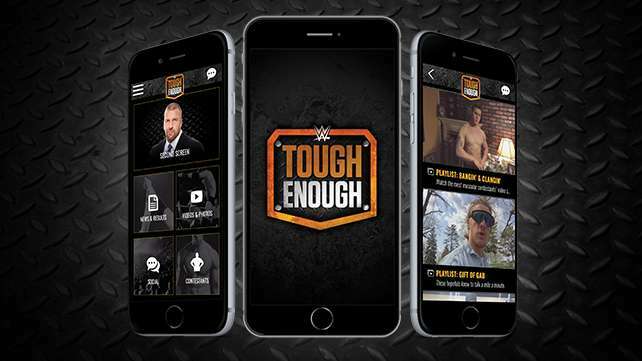 The revolutionary WWE Tough Enough App is now available for download. This app will provide an unprecedented fan experience before, during and after the show by enabling fans to vote for who stays and who goes with results calculated in real-time during the final minutes of each episode. The app will also include competitor bios and video and social updates as the competition unfolds throughout the week. Next Post Orlando Science Center Discount Admission Tomorrow!